Again love these oversized pillows! Who says you can't ride the waves...in your sleep. This brand new collection of Tommy Bahama printed body pillows is ready to add some flair to your bedroom. Unlike most body pillows, these feature an upgraded down alternative polyester that squishes where you want it, versus rigid stiff batted polyester. the best body pillow I have purchased to date. Well stuffed with plenty of filling. A firm body pillow which I like. Brightly printed fabric. Stitched good. I bought body pillow covers to go over it so it will not have to be washed. It is just the right size. I LOVE these Tommy Bahama Body Pillows. They add great color to a room and are even very comfortable to use as pillows to put my head on. 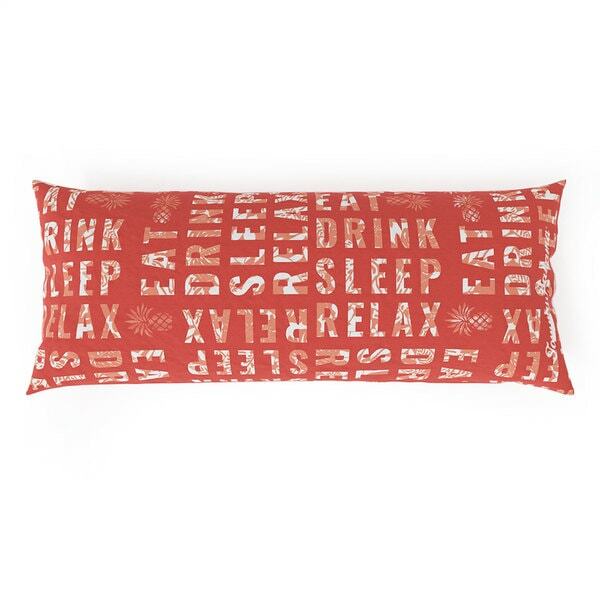 This Tommy Bahama hypoallergenic body pillow is beautiful! It's well-made, the fabric is gorgeous and I really like it. It's fluffy, fluffy, fluffy! Very soft. It never smelled bad from the time I opened it. But... I'm not completely satisfied with it. The only problem is, as fluffy as it is, it still separates when you use it. It doesn't stay separated. It fluffs back up and looks great on the bed, but I use this between my knees because I am a side sleeper. There's very little fluff between my knees when I use it. The whole purpose of using it for side sleeping is to keep the knees separated and it really doesn't do a good job at that. I think the fill they use is almost TOO fine. I don't know how else to describe it. Also, the cover is not washable as far as being able to remove it and put it in the machine. It's spot clean only for this item. So unfortunately, it's only going to get 4 stars from me. I would recommend it to a friend, but with the warning that it isn't as dense as I would like it to be and if they are purchasing it to put between their knees to side sleep, I'm sure there would be a better choice for that purpose. But if they're purchasing it to look good on their bed, it would be a top-notch purchase. It is a good price, especially for the quality workmanship, and of course the name "Tommy Bahama" beautifully embroidered on it. My son loves the Tommy Bahama Body Pillow. It provides extra support on his back and he’s getting better sleep than he has in a long time. Absolutely love this body pillow. The color goes great with my room. The quality of the pillow is absolutely amazing! Overstock never seems to fail me. Love the pillow in respect to the color and the size. Great just for show as I'm using it. The only draw back is there doesn't seem to enough stuffing, it's very flimsy.. I can see if it's being used as a body pillow the shape will not last long. Nice body pillow. Daughter loved this gift. Keeps in room so can read on. Looks good and no need for a cover. The item is quite large and comes folded so may need to move the filling around when first get. I bought two of these for my grandsons ages 4 and 7 for Christmas. They love them. Great product. Fluffy and comfortable to lie on the couch. This was really soft and looked must more expensive than what I paid for it. My son has a bad back and uses it in his lazy boy for extra cushion and finds it very comfortable. Great price ,Beautiful color body pillow that appears what I need to get a good night sleep !